The Madras Sanskrit College owes its origin to the philanthropy of "Mahapurusha" Sri V. Krishnaswami Iyer (called so by Mahatma Gandhi himself). Krishnaswami Iyer was a leader of the Madras Bar Association and later a judge of the Madras High Court and finally a Member of the Governor's Executive Council till his last day on 28th December 1911. Sri V. Krishnaswami Iyer, noticing the diminishing number of teachers and fast deteriorating standards of Sanskrit during his time, took upon himself the heavy task of founding a place for imparting instruction to the highest standards in the classical works and sastras on the traditional methods of intensive study. It was thus in December 1905, the concept of the Sanskrit College was mooted, and on February 1, 1906 the college began functioning. Sri V. Krishnaswami Iyer, Rao Bahadur Sri A. Krishnaswami Iyer and Sri A.S. Balasubramania Iyer formed themselves into a Committee, each one contributing to the growth which was steady and spectacular. On the 27th October 1907, a Trust Deed was executed and registered by Mr. Krishnaswami Iyer and Sir C.P. Ramaswami Iyer which had for its object, the maintenance of a Sanskrit College and also the encouragement and promotion of research and investigation into several departments of Oriental knowledge. The college encouraged students to study works in Mimamsa, Advaita Vedanta, Vyakarana, Sahitya, Jyothisha and Nyaya as well as in all the special branches of study selected by the students, thus contributing to the progress of human thought both in the East and the West. The scheme of the Madras Sanskrit College was an improvement over the existing Sanskrit Colleges in Mysore and Travancore. Not only was English regularly taught but also regular classes were held in comparative and critical studies. The period of study in the college was five years. At the end of the fifth year, the college gave a certificate called Visarada in Mimamsa, Vedanta etc. In the year, 1907, the institution was recognized by the Director of public Instruction and was placed in the list of aided Instructions with a grant of Rs. 1000. The far sighted founder's discovery, Mahamahopadhyaya professor S. Kuppuswami Sastriar, was the first principal of the college. It was very fortunate that the College had such a dynamic person as its first Principal. Sastriar himself embodied the synthesis of Pundit erudition and modern critical scholarship which V. Krishnaswami Iyer had envisaged. Because of his knowledge in both types of studies, he perfected the scheme of studies for the various courses. He incorporated important Sastraic texts in the Degree curriculum and Comparative Philology and History of Literature and Essay in the Siromani course. During his time, the college progressed very well and achieved a great reputation in the world of Sanskrit. Sastriar was the principal from 1906 to 1910. Mahamahopadhyaya Sri Venkatasubba Sastrigal. Pundit Srinivasa Sastri and Mahamahopadhyaya Sri Chandrasekhara Sastrigal were the other eminent scholars in the faculty who specialized in the many branches of Oriental Learning. They formed a great team under the leadership of Prof. S. Kuppuswami Sastri. The first batch of students was noteworthy on account of the fact that many of the students later distinguished themselves as some of the most eminent scholars and professors in India. On April 28th, 1915, Mahatma Gandhi visited the college and expressed great admiration and satisfaction with the work of the college. On 9th October 1922 Dr. Rabindranath Tagore also visited the Institution and was extremely pleased with the performance of the college, especially the encouragement of Sanskrit learning and the study of Advaita philosophy. 1927 the title of Mahamahopadhyaya was conferred by the Government of India on Prof. S. Kuppuswami Sastriar, the first Principal of the college. Another old student of the college, Pundit Ananthakrishna Sastrigal was also honored with the same title. Eminent scholars like Dr. Paul Tuxon of University of Copenhagen, Dr. F.W. Thomas, Professor of Sanskrit Studies, Oxford University, Sir Mirza M.Ismail, the then Dewan of Mysore, a distinguished scholar professor M. Hiriyanna have visited the college and expressed their admiration over the functioning of the Institution. Many other distinguished scholars have also subsequently visited the college. In 1966, the Jyothisha Siromani course was started at the college with the permission of the University of Madras and was duly affiliated to it. The Govt. of India gave financial aid. The Vyakarana Siromani course was started in 1973 with affiliation to the University July 1977. Under this scheme, the Union Government has fixed the salary of the teachers on par with the lecturers' salary in a first grade degree college of Madras and financial aid from the Government. From the beginning of the academic year 1977, the College was selected by the Ministry of Education and Social Welfare, Government of India, for receiving grants under the scheme of Adarsh Sanskrit Pathasala (later Mahavidyalaya). The application for the above grant was made with the concurrence of the State Government. The Government of India has been paying the grant from 1977 till date. From the Academic year 1979 – 1980, the Madras University has revised the pattern of the Siromani Course and increased the duration of the course from four years to five years. The syllabus for the course was also revised. Under the new pattern two more language papers viz. English and Tamil or Hindi were prescribed in the syllabus in addition. The College completed a Hundred Years of its purposeful and useful existence on 1st Feb 2006. To celebrate this occasion, the Management of the college organized various programs throughout the year. 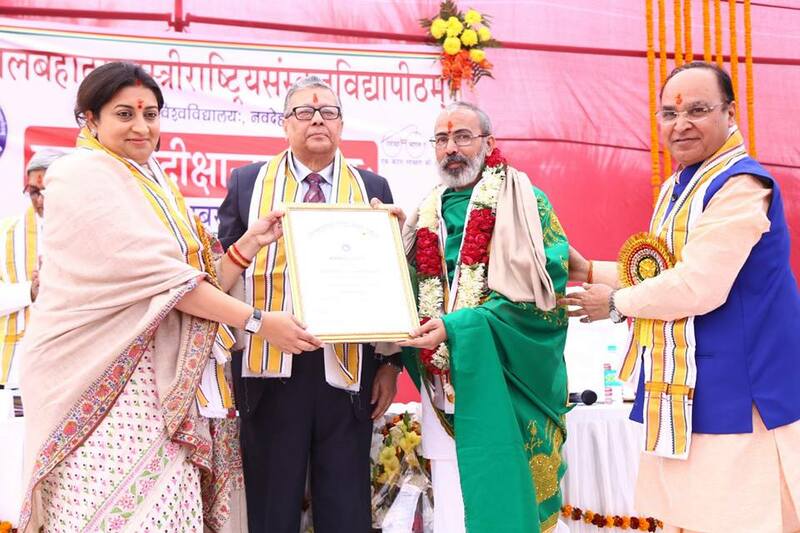 Many of our Principals and students of this College have become well known scholars of international repute and have also been awarded prestigious titles like Mahamahopadhyaya and have received Certificates of Merit from the President of India. The College had been able to produce such stalwarts as it had provided opportunities to students to study the Sastras without any compromise in the method of learning and at the same time obtain formal academic recognition. Looking back, the college is justifiably proud of its achievements; the College hopes to continue its services to the cause of Sanskrit learning beyond the "Hundred Years" which it reached on February 2006 A.D. The institution has the honor of capturing the highest number of medals in All India Sanskrit Elocution Contest, conducted by Rashtriya Sanskrit Sansthan, New Delhi, annually. 1906 - The College was founded by Hon'ble Sri V Krishnaswami Iyer on 1st Feb., started functioning in a rented building belonging to Sri Bhasyam Iyengar in Pelatope, Mylapore. The period of study in the college was five years. At the end of the fifth year, the college gave a certificate called " VISARADA " in Veda, Smrithi, Mimamsa, Vedanta etc. Special provision was made for the study of English and modern methods of criticism. 1907 - Recognized by the Government of Madras. 1912 - The College was affiliated to the University of Madras and was placed in the list of aided Institutions with the grant of Rs. 1000/-. 1917 - Professors to teach English language were appointed separately. 1925 - Started the Sahitya Siromani Course affiliated to the University of Madras. The College also started preparing students for the Certificate of Proficiency in Oriental Learning, Hindu Law and Philology. 1961 - Started Veda Bhashya Courses in Rig and Krishna Yajurveda. Subsequently added Sama Veda Bhashya and Sukla Yajur Veda Bhashya with the financial aid of the Ministry of Education & S.W. Government of India. These courses were continued till 1972. 1966 - Started Jyothisha Siromani Course with affiliation to the University of Madras and financial aid from the Government of India. 1973 - Started Vyakarana Siromani Course with affiliation to the University of Madras and financial aid from the Government of India. 1977 - Recognized by the Government of India. Ministry of Education & Culture under the Scheme of Adarsha Sanskrit Pathasala with concurrence of the State Government and began receiving grant from the Government of India. 1979 - University of Madras revised the pattern of the Siromani course with increase in the duration of the course from four years to five years. Under the new pattern, two more language papers viz, English and Tamil or Hindi were also prescribed in addition to the Sastraic subjects already prescribed in the syllabus. The language portions cover the text books prescribed for the S.S.L.C., plus two and B.A., at three stages at the end of I year, III year and V year respectively. 1989-90 - Admission was thrown open to women students. 1999 - Nyaya Siromani course was started with the approval of the Univ. of Madras. 2004-05 - From this academic year, the University of Madras has revised the syllabus of Sanskrit Siromani Course with seven years duration under 10+2+3+2 pattern under CBCS with Semester scheme. Prak-Siromani course – 2years, Sanskrit Siromani Madhyama (B.A. )-3 years and Sanskrit Siromani (M.A) -2 years. The University of Madras has included English, Hindi/Tamil and Computer Science in the curriculum as compulsory subjects for this 7 years' course to meet present day needs and develop communication skills.